You are needed to support the Chamber! This event features a great day of walking the halls of our State Capitol in Sacramento with an informative luncheon program. The day will start with us meeting at the Ambrosia Café for a quick meeting with pre-legislative visit orientation between 9:45 am to 10:00 am. to the Capitol to continue our legislative meetings and be completed by 4:00 pm. We are so blessed to have many great collaborators who steadfastly support our Chamber’s mission. This year, not unlike any other year we saluted an individual and a corporation for their work on behalf of our community and the Chamber – Tuolumne’s Dennis Hendricks and the American Honda Motor Co., Inc. Also, this year during the lunceon, we honored Paula Starr with our third presentation of the Chamber’s Lifetime Achievement Award. The food was delicious, the networking was superb and all of the attendees provided for great fellowship as “generators of success” in the Chamber’s mission to promote economic self-sufficiency for our people through business enterprise success. 2018 Warrior Award – Corporation – American Honda Motor, Co., Inc.
Another highlight of the luncheon included the presentation of the Chamber’s Annual College Scholarships. Thank you to all who sponsored an award – including an additional $1,500 scholarship that was recently donated by Northrop Grumman Corporation -- and donated during our auctions and raffles throughout the year. 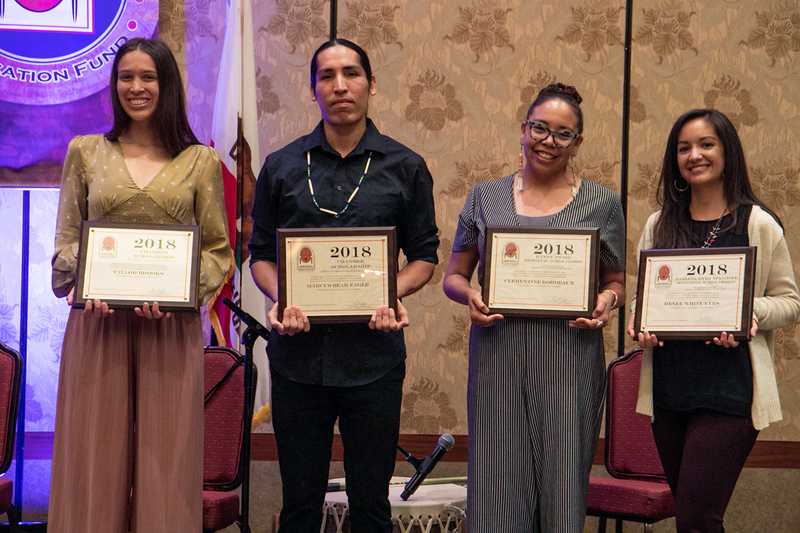 Pictured below are four of the recipients who were able to attend (l to r): Taylor Brooks, UCLA; Marcus Bear Eagle, UCLA; Clementine Bordeaux, UCLA; and Renee White Eyes, UCLA. The complete list of scholarship awardees with their donors is below the photo. 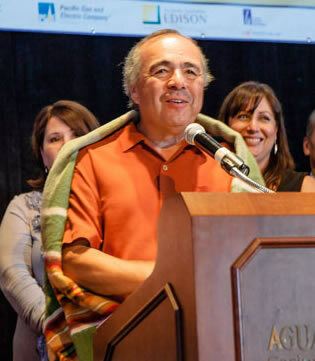 Also the Chamber extends a special thank you to an awesome human being – Walter Ahhaitty – pictured below, for once again conducting our live auction during the luncheon to raise funds for our scholarships and Jr. American Indian Chamber of Commerce program. of this luncheon and our efforts. 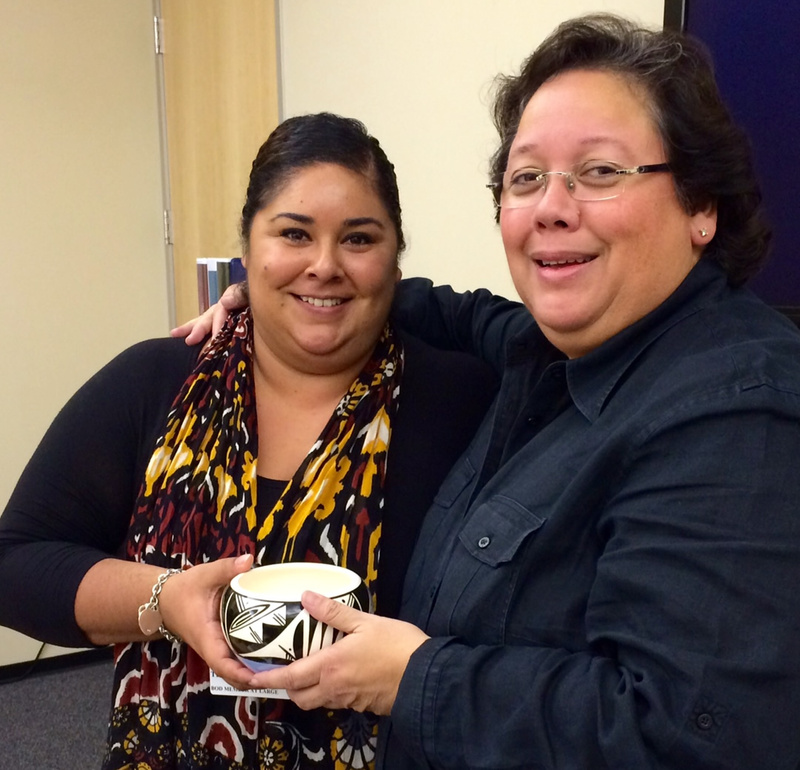 Diana Terrazas, you are one of the best community organizers around. Thank you for your support and partnership. Rick West, famous Rick West, thanks for being there to welcome us and provide remarks – and help “one-armed” Venessa with her Indian taco. 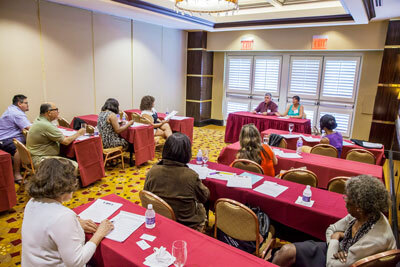 Our AICEF-PTAC training presented by our program manager Venessa Gleich, was well-attended and super informative. 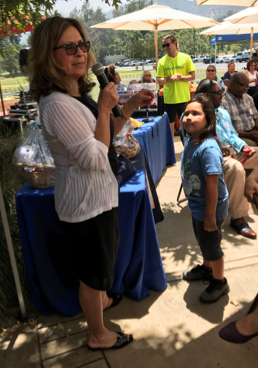 Cheri Myron (see below) along with her special deputy William Morales (Paula Starr’s grandson) ran an exceptional raffle. Thank you to all who donated items and to the Pala Band of Luiseno Indians and their Chairman Robert Smith for donating an overnight stay to their beautiful resort. It was another extraordinary day to promote #BuyIndian, network and strengthen our community. Thank you all for your support. There is no charge for this event, please consider donating raffle item(s) and/or purchasing raffle tickets to benefit our scholarship fund. Organized by CA Department of Water Resources Tribal Liaison, Anecita Agustinez (Class of ’17), Chamber President Tracy Stanhoff (right) and Chamber Tribal Advisory Council Leader, Chairwoman Lynn Valbuena of the San Manuel Band of Mission Indians (left) presented at the recent Leadership California event held last week at Yocha Dehe’s Cache Creek Resort in Brooks, California. Tracy and Lynn flank Jennifer Persike, Executive Director, Leadership California. Leadership California is a network of over 1,600 accomplished women, dedicated to advancing the leadership role of women in business, communities and public policy. Seventy accomplished women from the entire state of California form each year’s class. This year, Vice Chairwoman Tishmall Turner of the Rincon Band of Luiseno Indians and Joely Proudfit of Cal State University San Marcos are in this year’s class. We thank Anecita and Leadership California for the interest in promoting women in leadership and using this tribal leader panel as an example. Above, the Pechanga Tribal Council and members of the Pechanga Development Corporation surround Pechanga Chairman Mark Macarro as he cuts the ribbon to open their expanded resort. The updated resort has 1,200 rooms, seven swimming pools, a two level spa and new restaurants. Gloria Masiel, Andy Masiel, Sr., Pechanga Development Corp; Chair Lynn Valbuena and her husband Steve Valbuena. Minority Business Opportunity Day (MBOD) is an institution in Los Angeles. Always highly anticipated, MBOD brings together more corporate members, minority business enterprises, expert speakers and sponsors than any other single SCMSDC event of the year. MBOD 2018 will be held at an exciting new venue – the Pasadena Convention Center – which, because of its central location, will create even more possibilities for sponsors to create associated activities and opportunities for engagement. Programming for the daylong event will include keynote speakers, an exhibit fair, matchmaking interviews and a closing reception. For questions regarding sponsorship or exhibiting opportunities, please contact events@scmsdc.org. Native Voices At the Autry presents Bingo Hall by Dillon Chitto at The Autry, March 9 – 25. See flyer below in our Partner Event section. Later this year Stories From the Indian Boarding Schools, a Spring tour and then a Festival of New Plays at The Autry, June 6-7 and La Jolla Playhouse, June 9-10, 2018.
and Vice Chairwoman Tishmall Turner of the Rincon Band of Luiseno Indians. These two leaders did a great job! Chairman Bo Mazzetti, of the Rincon Band Of Luiseno Indians and the leader of the Southern California Tribal Chairman’s Association (SCTA), this year’s Native American Day host tribal organization. Chairman Mazzetti welcomes the crowd. our relationship with the Attorney General. Chamber member, Elizabeth Perez of GC Green and Chamber President Tracy Stanhoff of AD PRO flank, California State Secretary of Veterans Affairs, Vito Imbasciani, M.D. We discussed the need for technical assistance specific to Native American Vets, hopefully a partnership will be established. Autry Museum enjoying the day. booth neighbor for this day. His speech provided all of us with his commitment to our efforts – and the efforts of all diverse communities in our state. 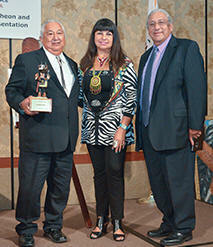 We honored him as the Warrior as his support for Indian Country is exceptional. Our Chamber was truly honored to have the president of SCE speak at the EXPO. It was the first time we had the president of a major coporation support our events. We are truly grateful and presented him with our “Soaring with Eagles” honoring for the top-notch support SCE provides the Chamber. Brenda gave us a great verbal history of her experiences with her tribe’s and her successful efforts to start gaming in Indian Country; and the historic Cabazon case victory. Our breakfast program was highlighted by a frank and fun discussion with Tom on his daily job activities, overall acccomplishments and the meaning of having an American Indian in a top level position at a global business titan – AT&T. Another great tribal discussion led by our wonderful partner Catherine Sandoval. Special thanks to Rosemary Morrillo, Brian McDonald, Marcus from Campo, Adam from San Manuel for participating as tribal leaders. Also, additional thanks to: Anecita Agustinez, tribal liaison from the Cal Water Department; Trina Martynowicz, US EPA, and others who thoughtfully joined in for added resources. The Chamber thanks these two ladies for leading a nice group of participants in the health walk and stretch. This activity is a great way to start any Monday! Susan topped Dennis as this year’s cup stacking champ. This fun, ice-breaker started Tuesday off with a ton of excitement. Thank you to all of the participants, sponsors, speakers, volunteers and supporters of our annual EXPO. Once again we had a stellar line-up of keynote speakers, tribal leaders, academics, government agencies, corporate partners and other entities seeking to do business with tribes, tribal enterprises and our American Indian/Alaska Native owned busineses. Our Chamber and our AICEF-PTAC endeavor each year to provide for an action-packed two and one-half days of business capacity building and connections for opportunities. Below are just a few of the photo highlights – enjoy! An oil pipeline approved by the Army Corp of Engineers to be built through lands of cultural meaning, burial grounds and over tribal water supplies has been the cause of historic protest by the Standing Rock Sioux Tribe, whose lands this oil pipeline affects. Thousands of American Indians from all over the United States in solidarity with the tribe, have convened in a camp to protest the endangerment of the Tribe’s water supply that the building of this pipeline represents. In addition to the destruction of spiritual and culturally sacred Tribal lands and the endangerment of the area’s water supply, one of the main issues with the process of the building of this pipeline is the Tribe’s assertions that it was not properly consulted with by the Army Corp before approval was granted to build. We support the Standing Rock Sioux and applaud all those who have traveled long and far to assemble, pray, sing and peacefully protest this unjust misuse of tribal lands. 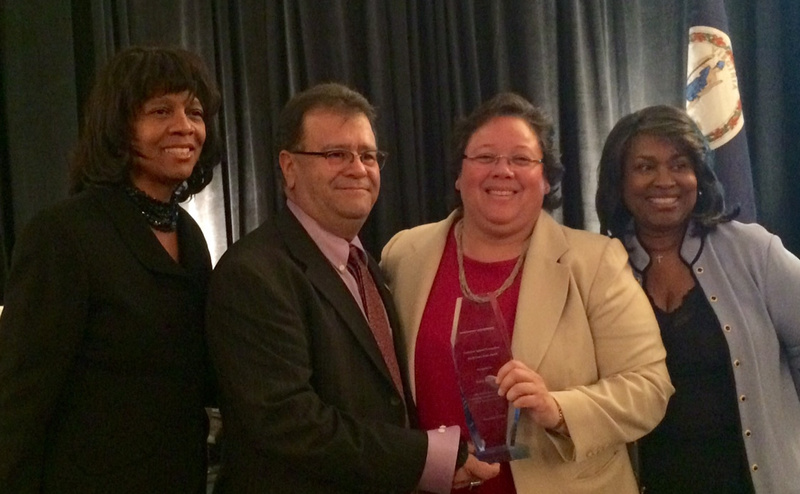 “Soaring Together Through Strategic Partnerships"
The 2015 Warrior Awards went to Anthony Pico (third from left) and the California Water Association, Jackie Glover (second from left) accepting the award on their behalf. The Warrior Award is the highest honor that the Chamber awards each year to a deserving corporate partner and tribal leader. Both the California Water Association (CWA) and Former Chairman Pico provided rousing acceptance speeches to the crowd. We honored CWA for their participation in Chamber events and activities and their keen interest in increasing contracting with our people within their industry. Former Chairman Pico has been an icon in Indian Country leadership for decades and we thank him for his service to everyone in our community. MORE THANKS AND PHOTOS FROM THE LUNCHEON TO BE SHARED SOON! Chamber Members were hard at work during the first part of our annual Northern Cal Chapter Holiday event with PTAC Training and luncheon hosted by our great partners at the Dry Creek Band of Pomo Indians. The Mark West Lodge was our picturesque location. The food was delicious and the meeting rooms were comfortable. This lodge is owned by a Dry Creek tribal member and her husband. 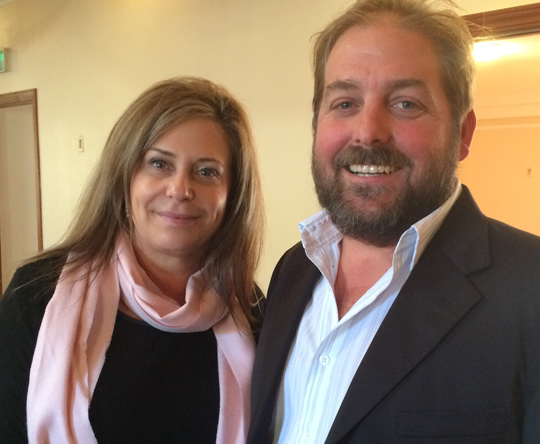 Northern Cal Chapter leader, Matthew Kennedy thanks our special guest presenter, Lisa Castillo of AT&T. Lisa presented then led a great discussion on finding opportunities and positioning your business for success in 2016 and beyond. 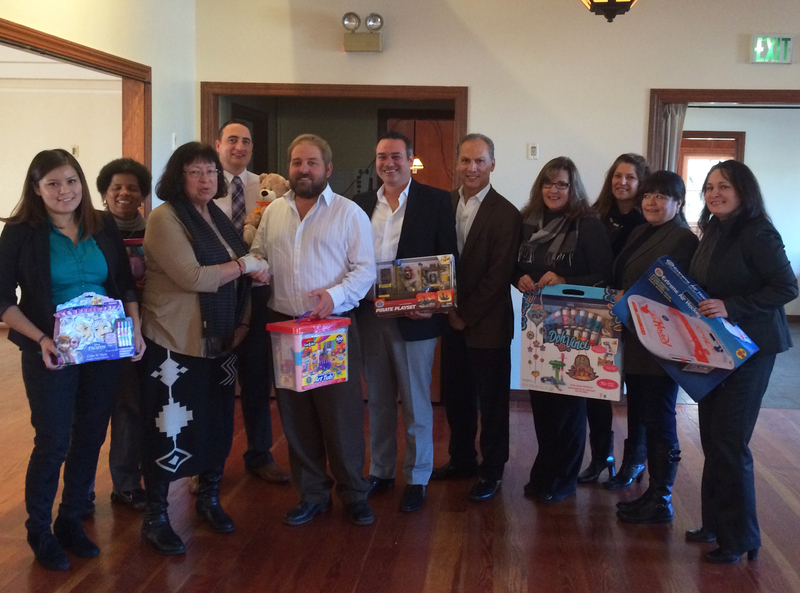 American Indian Child Resource Center’s Mary Trimble Norris and board member Damian Wilson, also a tribal liaison for the US EPA; accept toy drive items and donations for toys from the Chamber and our members. 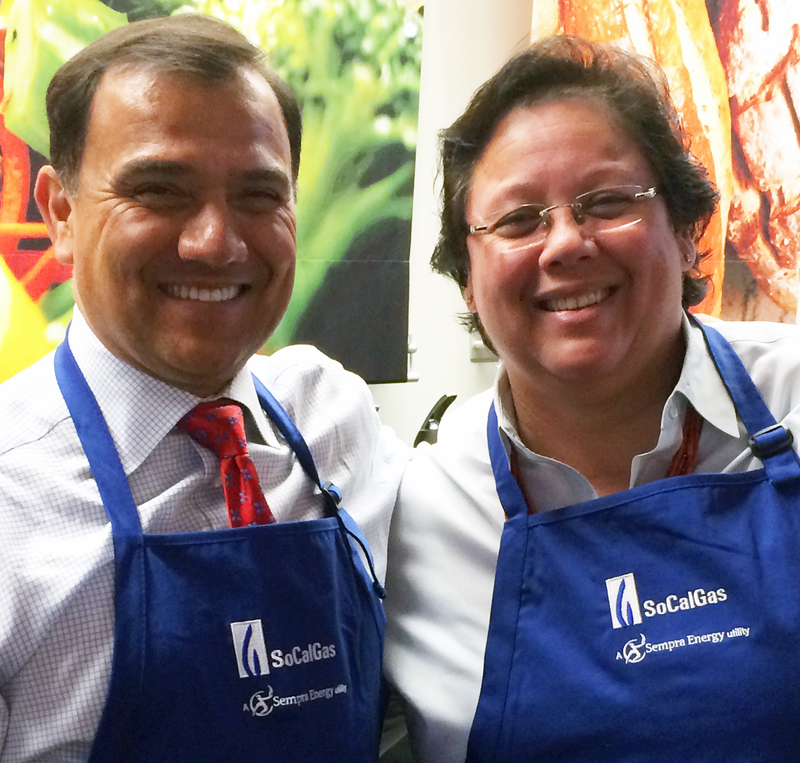 Southern California Gas Company President & CEO Dennis Arriola and Chamber President Tracy Stanhoff pose in their fine aprons at a recent educational workshop held at SoCalGasCo’s Energy Resource Center. Along with the rest of the Gas Company’s Community Council, Dennis and Tracy cooked using the latest and greatest in commercial cooking equipment for restaurants and businesses. Yes, both Dennis and Tracy worked in the kitchen with others attending making a full festive holiday lunch. Believe it or not, the food was just delicious – must have been those high tech ovens. Chapter Meeting - Cheers to All! Thank you to the great folks at the Pauma Band of Luiseno Indians for their assistance at the San Diego Chapter meeting. At left is a photo of many of the meeting attendees in the private dining area adjacent to their buffet where we met. 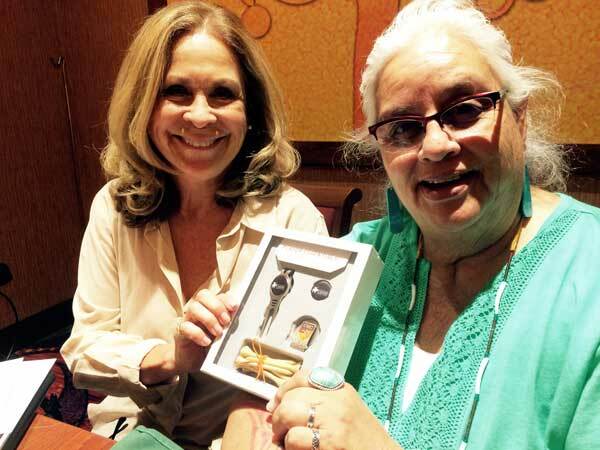 San Diego Chapter leader and statewide board member, Cheri Myron, presents a “thank you” to Indian Country leader, Juana Majel from the Pauma tribe who was the meeting presenter. Juana spoke on the after effects of the EXPO and the strategic planning roundtable. We were happy to see all of the attendees, especially our good hearted friend Chato who was back in fine form after emergency neck surgery earlier this year. Steff Saavedra was happy too, nice photo bombing! Chamber President Tracy Stanhoff (page 42), Chamber Advisory Council members Chairwoman Lynn Valbuena of the San Manuel Band of Mission Indians (page 48) and NAFOA Vice President VaRene Martin (page 41) were featured as part of Indian Country Today’s - 2015 50 Faces of Indian Country special edition. The August edition of Alaska Beyond magazine, the official magazine of Alaska Airlines featured Chamber President Tracy Stanhoff in their article titled Indigenous Entrepreneurs. Check out the article starting on page 70 by clicking on the photo above. Thank you everyone, so many good opportunities and connections were made it is very difficult to list them all. As the sucess stories resulting from the EXPO unfold, we will endeavor to provide updates. Please enjoy this EXPO ‘15 photo gallery – photos were professionally shot by our own Native businessperson Joshua Tousey. Also a three cheers to Dry Creek Rancheria Band of Pomo Indians for their very kind donation of their wines from their vineyards for the Monday night dinner. 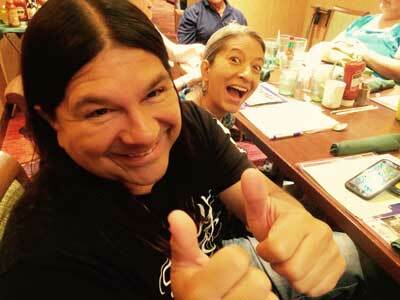 Personalized Indian Business Development Session Scholarship Fundraising Golf Tourney – Hey Hedi! Good Morning Stretch – Allison Hicks Leads The Moves Followed By A Health Walk... Go-Go-Go! THIS WEEK WE HAVE LOTS OF BIG NEWS, first, thank you to the California Water Association and the Office of Indian Energy and Economic Development, Bureau of Indian Affairs (OIEED) for signing up as a top level sponsor. Additionally, Toyota has come on board as a Thunderbird level supporter; Blair, Church & Flynn Consulting Engineers, OCTA, and East Bay Municipal Utility District have come on as EXPO sponsors. AN OVERFLOW HOTEL HAS BEEN ESTABLISHED FOR YOUR USE, The Westin Mission Hills where we are holding our American Indian Chamber Golf Championships has great rates and is very close to Agua Caliente. See the link below. Please note the Agua Caliente Resort is sold out of our room block; Agua Caliente does however, have a small amount of higher priced rooms. ONLINE REGISTRATION CLOSES THIS FRIDAY 11:59 AM, computers may close but you can still register at the EXPO onsite registration desk, but sign up early to avoid any lines at the event. 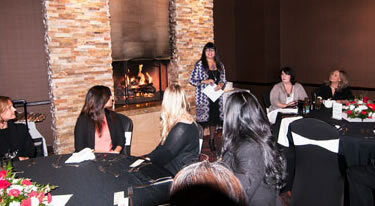 TABLE TOP TRADE SHOW IS SOLD OUT, we have established a waiting list – Call Sophia at 213-448-2330! Attention All Tribal Leaders – You will not want to miss our annual tribal leader summit with tribal consultation. This year we will be discussing reservation and tribal land infrastructure development; right of ways; power purchase agreements (PPAs); broadband development; water rights, and business/economic development in a consultation format with Commissioner Catherine J.K. Sandoval and others who will be there to listen, and provide expert input. Attention All Tribal Enterprises and American Indian/Alaska Native owned businesses – get ready for the Sunday “Perfect Pitch” session and the One on Ones to be held on Tuesday afternoon during the Trade Fair! Contact Sophia for the Perfect Pitch form. 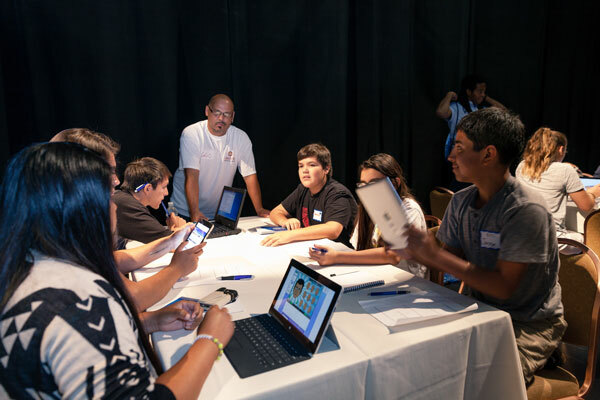 Attention All Youth for our Jr. American Indian Chamber – Tishmall Turner of the Rincon Band will be ready to lead our on-site computer lab for our hack-a-thon. Tishmall will be joined by our fearless Youth EXPO leaders Arnice Lamb of the Walt Disney Company and her co-host Cora Gaane of Wells Fargo. BIG NEWS! 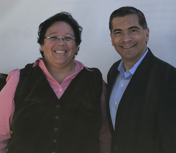 California Public Utilities Commission’s Commissioner Catherine J.K. Sandoval is confirmed for the EXPO, the Tribal Leader Consultation and more. Soon we will be announcing the esteemed tribal leaders who will be participating. BIG NEWS x 1! SCE’s Vice President of Procurement, Doug Bauder, is coming to speak as the Monday night Welcome Keynoter and support the Chamber once again. BIG NEWS x 2! Oneida Nation of New York tribal leader Ray Halbritter and AT&T’s highest ranking American Indian executive, Tom Brooks, vice president of AT&T are confirmed as luncheon keynoters to highlight Tuesday luncheon of our three day action-packed EXPO agenda. As you may know, the Oneida Nation of New York is the owner of Indian Country Today media network, Turning Stone Resort and other successful businesses. And everyone knows AT&T, as the telecommunications global giant and a great supporter of the Chamber. BIG NEWS x A Whole SBA Region & Washington, DC! Donna Davis, Regional IX, Administrator of will be attending to sign a Strategic Alliance Memorandum with the Chamber and the SBA Washington DC’s Office of Native Americans new leader, Nate Segal will be participating on our Tuesday morning panel regarding Supply Chain. More great participants to be announced soon. You will not want to miss the 20th Anniversary celebration version of the EXPO. Please make your hotel reservations and send in your EXPO registrations as soon as you can. EXPO trade fair tables going fast and we anticipate a sell-out. speakers from major corporations such as the Walt Disney Company, NBC Universal, Native Businesses, tribal leaders and other special guests. Each youth will also be presented with a certificate of completion suitable for framing. This Youth EXPO features an innovative entrepreneurial program that can be used to highlight youth applications for higher education and scholarships. Blazing Trails of Success For All! Sacramento Legislative Day & Northern Cal Chapter Meeting- Just Fabulous! Chamber members from throughout the state met up in Sacramento on May 14 to meet with legislators and partners to further our agenda of successful Indian Country business development. The State of California’s Go Biz website was the discussion with Brook Taylor (4th from left above) in the office of Governor Edmund G. Brown, Jr. / Office of Business & Economic Development. Go Biz’s functions will be very useful to those starting new businesses or wanting to expand their current situation. 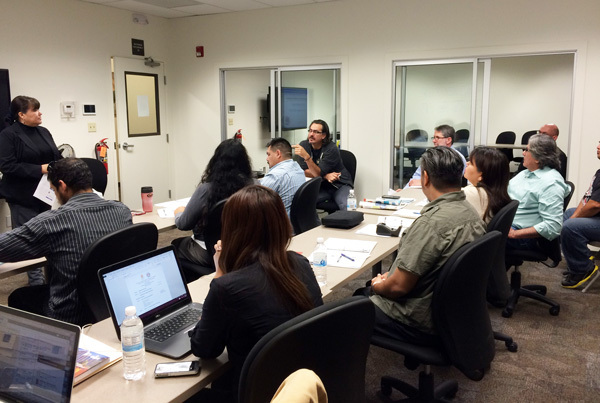 Go Biz will also be a very useful tool in the Chamber’s and our American Indian Chamber Education Fund Procurement Technical Assistance Center’s (AICEF-PTAC) training workshops – stay tuned for more on the Chamber’s and AICEF-PTAC’s use of Go Biz. After a successful meeting with the Governor’s Office of Business & Economic Development the Chamber then convened for a lunch meeting sponsored by AT&T with the discussion focused on Indian Country business development and how it is impacted by state regulations. The discussion was followed by a session for EXPO’15 agenda input from all who attended. A highlight of the day was the presentation of a Chamber 20th anniversary grant from our great partners at AT&T (shown above). Thank you AT&T for your outstanding support of the Chamber and our efforts throughout the United States on behalf of our tribes, tribal enterprises and individual American Indian/Alaska Native owned businesses. AT&T’s Chamber Advisory Council representative Ileana Winterhalter center presents the check to Chamber President Tracy Stanhoff and Chamber Treasurer Matthew Kennedy with (left to right) Shannon Marquez of Blair, Church & Flynn Consulting Engineers, Dry Creek Rancheria of Pomo Indians’ Secretary/Treasurer – Marjie Rojes, Tracy, KC Lyons of AT&T InterTribal affinity group, Ileana, Matt, Venessa Gleich of the AICEF-PTAC, Linda Miller of iOSafe and Dry Creek Rancheria of Pomo Indians’ Councilmember, Tieraney Giron. THANK YOU AT&T! We ended the day with a meeting with Assemblymember Eduardo Garcia, Chair of the Assembly Committee on Jobs, Economic Development and the Economy. Assemblymember Garcia is bringing forth a bill to recognize technical support providers in the state such as our AICEF-PTAC. This legislation could have a very positive outcome for our Chamber and recognize the great work of our PTAC. Please keep watch for AB 184 – Small Business Technical Support. AICEF-PTAC Program Manager, Venessa Gleich (standing far left), conducted a government contracting and tribal enterprise business structure training workshop to a packed classroom full of Scott’s Valley tribal council members and the tribe’s economic development staff at their tribal administration headquarters in Lakeport, California. Thank you to the Scotts Valley Tribe for their invitation to be part of their efforts! Also, while in this beautiful area of California, the Chamber and our AICEF-PTAC also stopped at the headquarters of the Robinson Rancheria Tribe and stayed at their hotel in Nice, California. WE BUY NATIVE! 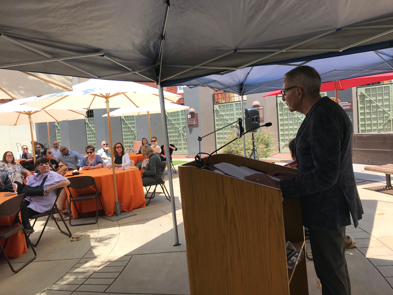 “The Future Is On Track” was the theme of the milestone celebration for the Orange County Transportation Authority’s OC Streetcar implementation held on May 11 at the Santa Ana Regional Transportation Center. 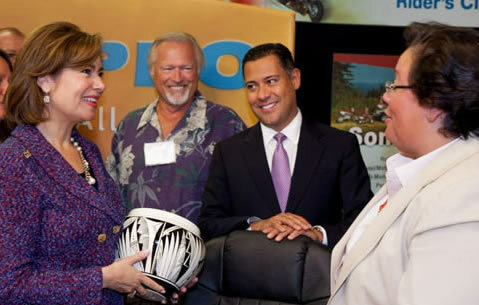 The celebration was attended by many area dignitaries, and Chamber President Tracy Stanhoff represented the American Indian business community, pictured above with OCTA Chief Executive Officer, Darrell Johnson (far left), Sr. Community & Business Development Specialist, Bekele Demissie (2nd left) and Tracy. 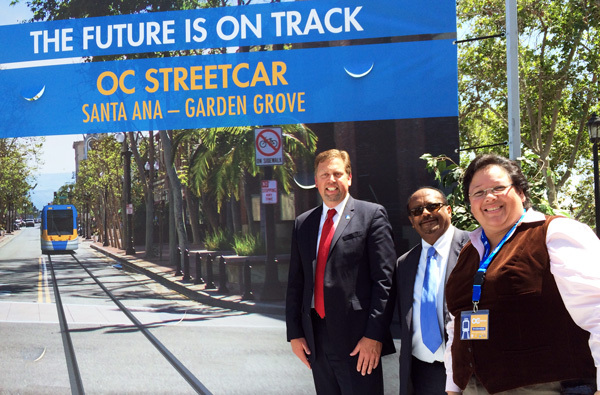 The first OC Streetcar route will be located in historic downtown Santa Ana connecting to Harbor Boulevard in Garden Grove, serving the OC’s busiest bus corridor. The Chamber will be advocating for our business inclusion in this building process. Native American Dancers and Singers will be featured before the game and by the big glove during the 7th inning at this annual favorite, Native American Heritage Month with the San Francisco Giants. Our good friend, Earl Neconie is one of the organizers and is taking orders for $60 club level tickets and $30 bleacher seats. Get there early to enjoy the festivities. And, reserve your seats today to enjoy all the benefits of the night – contact Earl Neconie at 510-459-7645; neconie@me.com or purchase via paypal 1CaLKiowa@gmail.com. Los Angeles, CA - In celebration of National Small Business Week, Chamber President, Tracy Stanhoff, attended a special event focused on International Trade and Innovation. 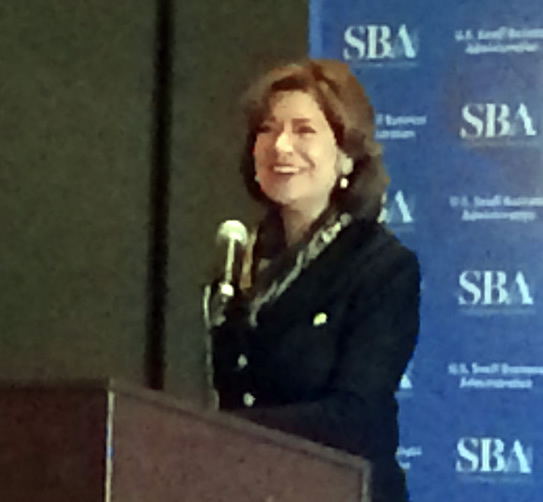 The keynoter at the event, was Chamber supporter US Small Business Administration Administrator, Maria Contreras-Sweet (shown above). Here's to our Chamber Small Business Warriors! Great Success – Thank You Everyone! Our panelists provided short opening remarks after which Chamber President Tracy Stanhoff asked the panel several questions focused on how to leverage theirs and your participation in the Chamber. A brief question and answer session from the “floor,” followed the formal discussion. 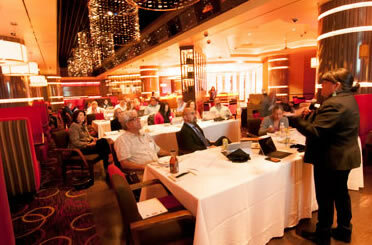 Everyone was then able to join in and provide input on purposed interactive changes to the usual agenda at our upcoming EXPO ’15 to be held July 19-21 at the Agua Caliente Resort in Rancho Mirage. Thank you to the staff at Marie Callender’s in San Juan Capistrano, as the meal, pie and service were exceptional. Thank you once again to our great partners at SCE who sponsored this meeting. And, thank you to everyone who attended and packed the private dining room sharing a meal, offering up their ideas, providing positive energy and lots of enthusiasm for the Chamber and Indian Country, together we make quite a dynamic organization. 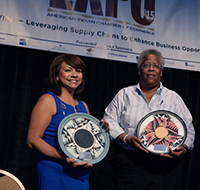 The Chamber and our American Indian Chamber Education Fund Procurement Technical Assistance Center are pleased to announce that EXPO’15 will be back at the beautiful Agua Caliente Resort on July 19-21, 2015. A two and one-half conference featuring business capacity building/mentoring sessions, tribal leader economic development consultation, keynote addresses, procurement panel discussions, one on one matchmaking, a trade fair and more. Details and registration informaiton to be announced in a few days! Long-time Chamber member, Larry Sharette, the owner of Sharette has been certified as a participant in the US Small Business Administration’s 8(a) Business Development Program. The Chamber is pleased that our American Indian Chamber Education Fund Procurement Technical Assistance Center (AICEF-PTAC) was engaged by Larry and provided critical assistance to Sharette in his quest for this certification. A LEED accredited professional, Sharette’s services include commissioning large buildings, hospitals, universities and K-12 schools. Larry will start the program immediately beginning with developing his business plan for participation in the 8(a) program. It is the goal of this program to fine-tune the skills of the participant for long-term success in the government contracting market. Good luck Larry, our AICEF-PTAC team is here to support you through this journey! Chamber member, Shannon O’Loughlin, formerly a partner in the law firm Lewis Brisbois, has been named as the new chief of staff to National Indian Gaming Commission (NIGC) Chairman Jonodev Chaudhuri. 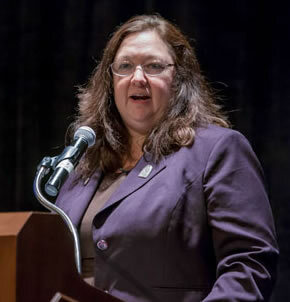 The NIGC serves as the federal agency charged with overseeing tribal gaming in the U.S.
Shannon, a citizen of the Choctaw Nation of Oklahoma and graduate of California State University, Long Beach, will lead the day-to-day management of NIGC operations, including compliance, finance, public affairs and the recently created technology divisions. Shannon is well-known throughout tribal communities for her stellar work on the Native American Graves Protection and Repatriation Act Review Committee. The Chamber congratulates Shannon and sends our best wishes to her on this exciting new opportunity to serve the United States and Indian Country! 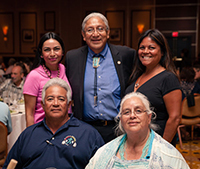 The Chamber is seeking volunteers to assist the National Congress of American Indians who are holding their annual Conference in San Diego from October 18-23, 2015 at the Town & Country Hotel. Details are in the flyer below. Please identify yourself as a Chamber member when volunteering. Several Chamber members attended last week’s 30th Annual Indian Gaming Trade Show presented by the National Indian Gaming Association (NIGA). Held this year at the San Diego Convention Center, Indian Gaming attracted over 6,500 attendees and hundreds of trade fair booths. Attendees included: Chamber President Tracy Stanhoff of AD PRO; Chamber Board Member, Cheri Myron of Native American Enterprises; Jeff Estep of Heritage Global Solutions; Allison Hicks of New World Environmental; Tishmall Turner of CSU San Marcos/Rincon Band of Luiseno Indians and VaRene Martin of NAFOA. 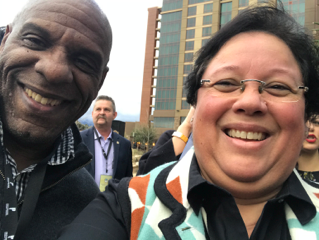 Chamber member Tribal leaders Chairwoman Lynn Valbuena of San Manuel Band of Mission Indians and Chairwoman Rosemary Morillo also attended participating in the main sessions for tribal leaders. 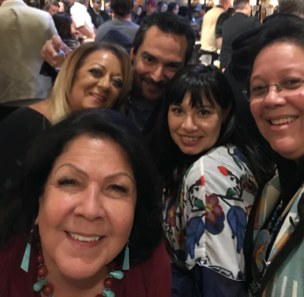 Overall it was an impactful week for the Indian Gaming industry – three cheers for the folks at NIGA for their great work! 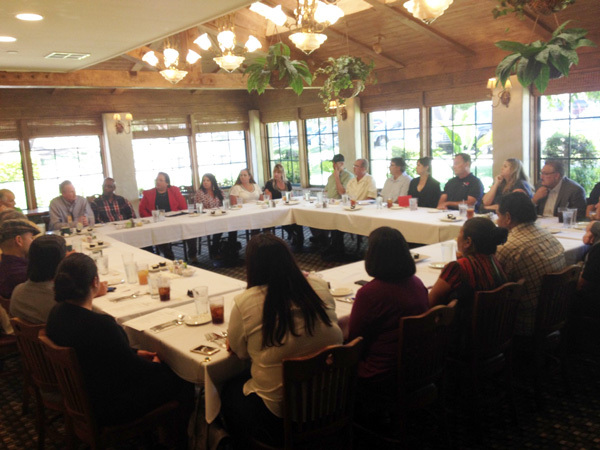 Crescent City, CA - The Chamber held our first Northern California Chapter meeting of the year, way up north at the Elk Valley Rancheria in Crescent City partnering with the Supplier Diversity and Procurement Outreach team from Pacific Power. We were very happy to meet the leadership of Elk Valley including their Chairman Dale Miller, pictured above left, with Northern Cal Chapter leader, Matt Kennedy and hold our first procurement outreach event with Pacific Power, pictured above right with Matt and our events gal Sophia Gleich. The day started off with an AICEF PTAC Training Workshop led by Venessa Gleich on structuring tribal enterprises and Native businesses for certifications with tips on successful applications. Venessa’s interactive presentation was followed by the one and only Nicole Murphy-Garcia, of Pacific Power who went through steps on how to access opportunities up at Pacific Power and previewed upcoming bids. 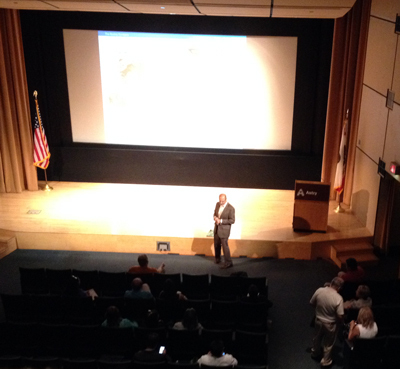 Monte Mendenhall of Pacific Power’s community outreach team, welcomed the attendees on behalf of Pacific Power. Other tribes who attended included the Yurok Tribe and Karuk Tribe. Chamber American Indian business members who attended included: AD PRO, Diversified Utility, SC Anderson, Blair Church & Flynn, Costello Kennedy Landscape Architecture, and others. The trip also featured a dinner (above left) with staff members of the Yurok Tribe, including our old friend Javier Kinney. 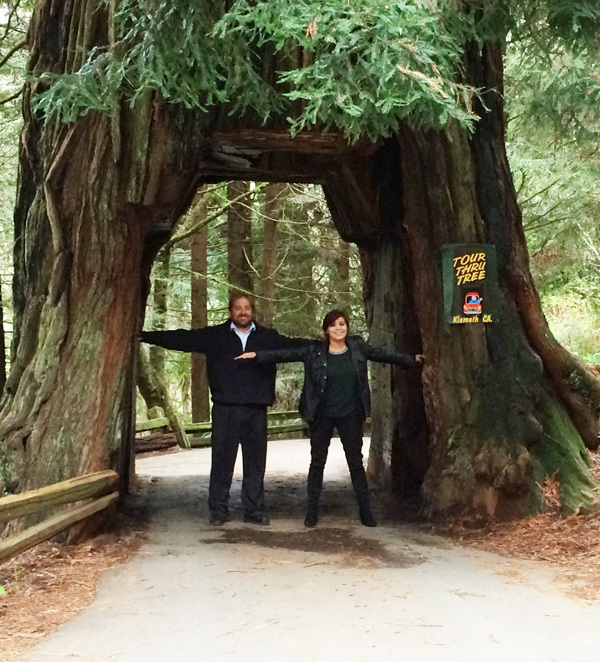 We also had time to enjoy the redwoods with Matt and Sophia standing in the tunnel of a drive-thru redwood (above right) – then Chamber President Tracy Stanhoff drove the rent a car through it. After a short tour of the Yurok Tribal area coast and redwoods we again focused our dinner purchase on our “Buy Indian” policy and enjoyed a delicious meal at the Steelhead Lodge now owned by Yurok Tribal Vice Chair Susan Masten. We look forward to a long-term partnership with Pacific Power and the tribes in this awe-inspiring area. And, finally Rose Cote of LAWA has transitioned out of her role in Supplier Outreach, and has been replaced by new liaison Harold Johnson. Welcome Harold and we will honor Rose for her long-term commitment to the Chamber later this year. Please say a prayer for Chamber member Lydia McCarthy whose husband Frank passed away unexpectedly last Friday. Private funeral services will be held shortly. If you wish to contact her, send Tracy a note at tracy@adproweb.com who will link you up with the remembrance details. What an event, what a training workshop and what a meal! 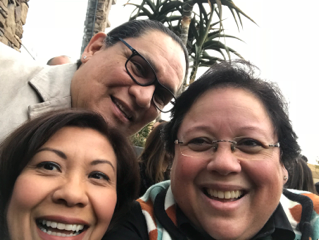 Those of us who attended the Chamber’s 20th Anniversary Kick-Off training workshop and reception dinner were treated to the “best of the best” from our hosts, the San Manuel Band of Mission Indians, and participants last Saturday, February 28. An over-flow crowd of members and tribal enterprise representatives joined in the first part of the day – a training workshop presented by the American Indian Chamber Education Fund – Procurement Technical Assistance Center (AICEF-PTAC) on “How to Start & Conduct A Successful Business“ with the main presenter being our Program Director, Venessa Gleich (left). Also, participating in the presentations were Chamber President Tracy Stanhoff and our Corporate Advisory Council co-Chair from Southern California Edison (SCE), Dennis Thurston. This training was followed by a lovely dinner reception attended by Chamber members and supporters that was in a private dining room in the Pines Steakhouse. The dinner buffet food was delicious and plentiful as we all enjoyed sushi, salads and entrees of steak, salmon and chicken. 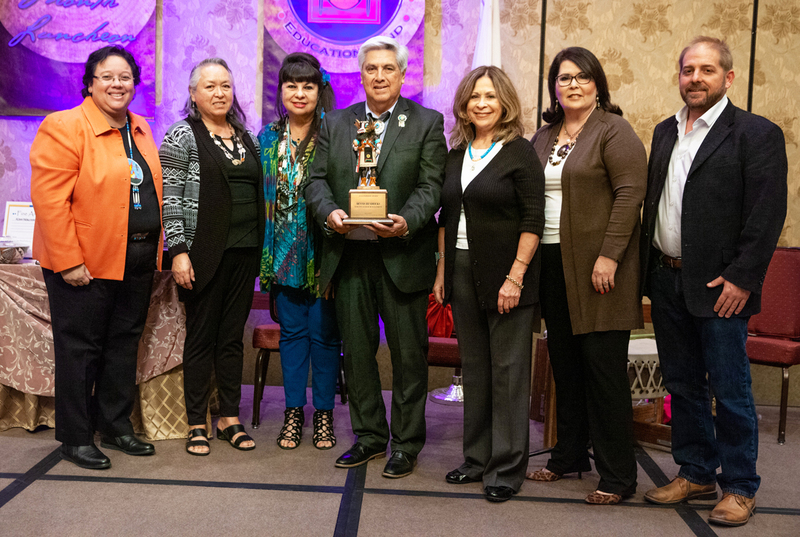 We were welcomed to San Manuel from their Tribal Chairwoman, Lynn Valbuena, pictured left and center above surrounded by four members of the Chamber’s Board of Directors. Joining the Chairwoman to enjoy the event with us from San Manuel, were former San Manuel Tribal Treasurer and Chamber Warrior Award winner, Audrey Martinez; the Chairwoman’s husband – Coach Steve Valbuena and their great outreach representative Roy Martinez, who worked diligently to organize the entire day for us. Our Chamber Advisory Council was well-represented by SCE’s Dennis Thurston, Cora Gaane of Wells Fargo, and Diana Terrazas of the Autry National Center. Additionally, numbers of our Chamber business owners were there to engage, learn, network and celebrate 20 years of the Chamber’s existence. We have heard that many enjoyed the casino night that followed dinner with Chamber members and supporters being seen all over the San Manuel Indian Bingo and Casino – dancing, gaming, visiting and enjoying a beverage or two in the lounges. Thank you San Manuel, thank you AICEF-PTAC and thank you to the numbers of Chamber members who enrich our organization in many ways. We look forward to 20 more years of providing the Chamber as a vehicle to advocate, mentor and support the business development in Indian Country. 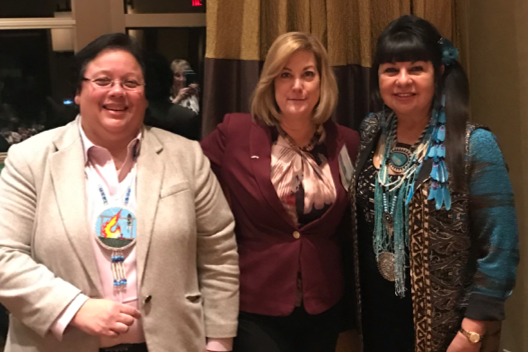 Chamber President Tracy Stanhoff was in Washington, D.C. this past week for the annual National Congress of American Indians (NCAI) Executive Winter Session. As noted in our Chamber e-news last week, Tracy met with numbers of influential folks while back in our nation’s capitol. 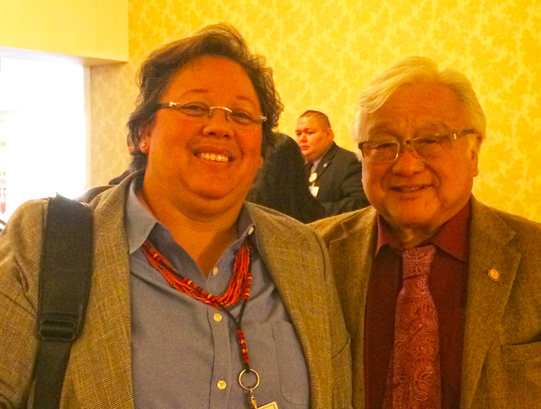 Tracy continued the week with brief discussions with California Congressman Mike Honda, pictured above. Congressman Honda represents the Silicon Valley. 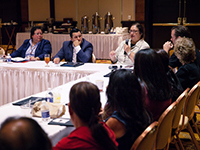 After the conclusion of the formal meetings of the NCAI Winter Session, Tribal Consultations were conducted by several agencies including the US Small Business Administration; who asked for comments on proposed revisions to the 8(a) program. Tracy was able to present the Chamber’s and our AICEF-PTAC comments to the participants from the SBA including our friend, from the Office of Native American Affairs, Chris James (far right). Chamber President Attends National Congress of American Indians In Washington, D.C.
Chamber President Tracy Stanhoff is in Washington, D.C. this week for the annual National Congress of American Indians (NCAI) Executive Winter Session. This NCAI session provides a venue for discussion of the legislative efforts in Indian Country including economic, infrastructure and workforce development. 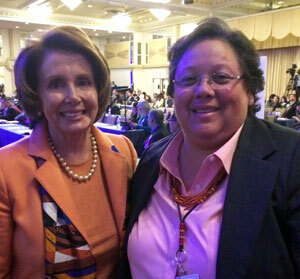 Tracy had brief discussions with House Minority Leader Nancy Pelosi (pictured above left), Senator Maria Cantwell (pictured below right) and US SBA Administrator Maria Contreras Sweet on the needs for both reservation and urban-based economic development programs in Indian Country. After the day’s formal sessions, Tracy will be “walking the halls of Congress” meeting with legislators to discuss economic development needs for our people. She will also attend an SBA consultation on the 8(a) Program on Thursday before returning back to California to join in the Chamber’s 20th Anniversary celebration at San Manuel. The Chamber has enjoyed a great relationship with the California Public Utilities Commission (CPUC). Together, we have been increasing opportunities for many Indian Country businesses by including our tribal enterprises and American Indian/Alaska Native businesses in the supply chain of the state’s utilities, telcos, and water companies. 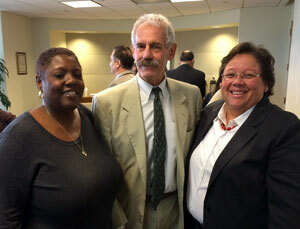 After many great years of leadership from Michael Peevey, the CPUC has a new president, Michael Picker. In a recent meeting with the California Utilities Diversity Council (CUDC), of which Chamber President Tracy Stanhoff President is a member, President Picker spoke of his priorities at the CPUC and his commitment to keeping the GO-156 supplier diversity effort momentum going forward. To achieve his goal of maintaining momentum, he has tasked us with identifying ways that his time could be best used to continue to pursue opportunities and business success for everyone. The Chamber wants to take a moment to acknowledge a historic “win” for our Chamber members and one of our utility member partners. 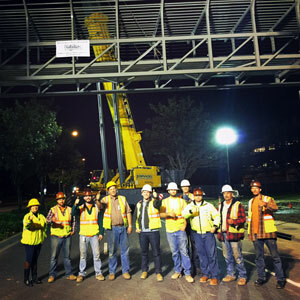 Recently, Southern California Edison (SCE) contracted for a new pedestrian bridge at their headquarters in Rosemead. Chamber member Blair, Church & Flynn Consulting Engineers designed the bridge, Chamber member Hal Hays Construction constructed the bridge – their team pictured above – and there was even a banner produced by Chamber member AD PRO which hung from the bridge. This project is indicative of the capacity and strength of our Chamber business members – and the commitment of our partners at SCE to use American Indian owned businesses. 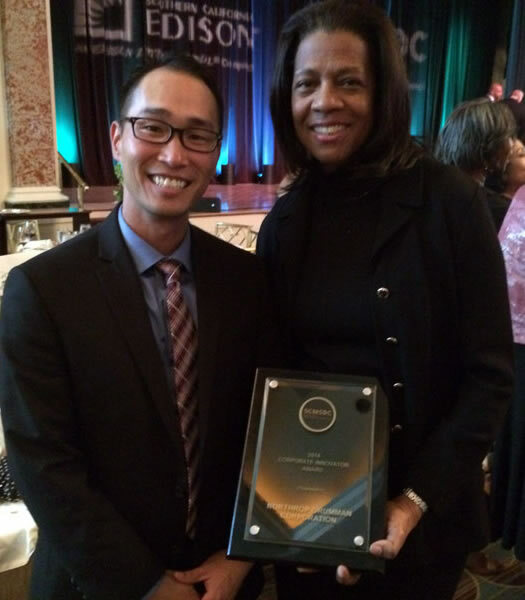 Thank you SCE, Dennis Thurston, Eric Fisher for their Supplier Diversity efforts. The Chamber sends much appreciation to the California Nations Indian Gaming Association (CNIGA) for their partnership with our Chamber, which was evident during this past week’s Western Indian Gaming Conference (WIGC) held this past week at the Harrah’s Rincon Resort in Valley Center, California. Pictured in the photo above are three of our Chamber board members –Secretary Sara Finseth, President Tracy Stanhoff and Treasurer Matt Kennedy surrounding CNIGA Executive Director Lee Acebedo and his wife Karen. Tracy also moderated a session on “Doing Business with Tribal Casinos” that featured panelists from accounting firm Moss Adams, Kitchell Construction and fellow Chamber member Colin Cloud Hampson, Attorney at Law. 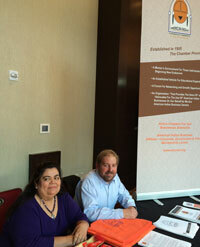 Sara and Matt staffed the Chamber’s outreach booth, shown below. 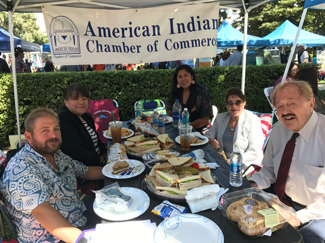 Also Chamber board member Cheri Myron also joined in the outreach effort on behalf of our tribal enterprises and American Indian/Alaska Native owned businesses. 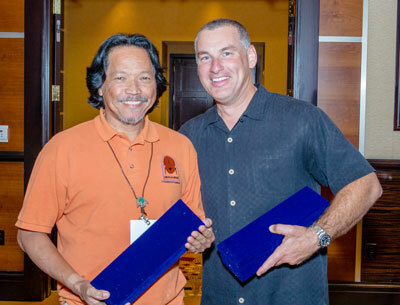 Special Thanks to SCE’s Dennis Thurston for joining in on the annual CNIGA golf tourney, golfing with Tracy, other Tribal leaders and CNIGA supporters during WIGC. We will also host our famous Youth EXPO once again concurrently with the EXPO on Tuesday, July 21, 2015. Matthew Kennedy, Owner of Costello/Kennedy Landscape Architects, a member of the Ponca Tribe of Nebraska has been appointed by the board of directors of the Chamber to fill the Board Treasurer/Northern California Chapter Coordinator position, that was left vacant due to Randy Twist’s passing. Matthew has been a longtime member of the Chamber and an active supporter of our Scholarship Fund. “It was an extremely hard decision for the Board to make since we have so many great business owner members in the Chapter, we know Matthew will be a tremendous asset to the Northern Cal Chapter and the Chamber’s leadership team. Please join us in welcoming Matthew to the board," said Chamber President Tracy Stanhoff. 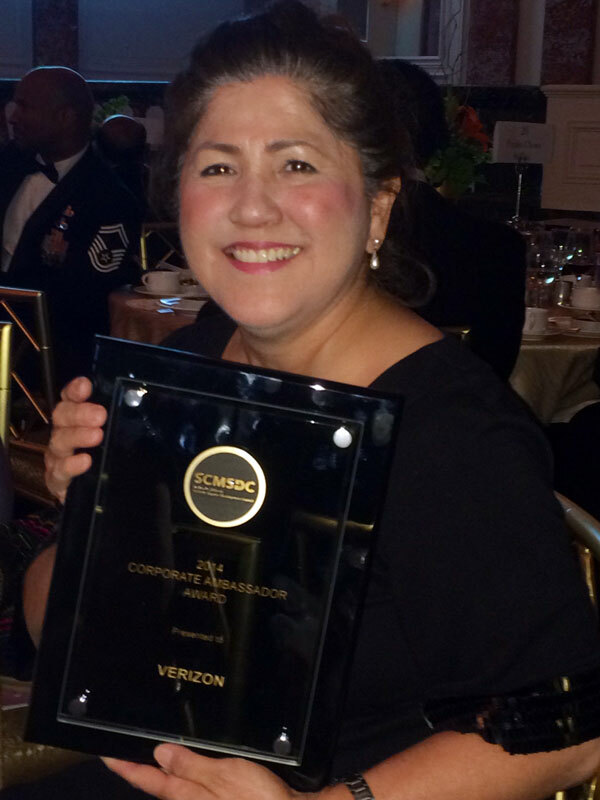 December, 2014 --Chamber president Tracy Stanhoff traveled to just outside of Washington, DC to receive an honor from the great folks at Northrop Grumman Corporation. Pictured above (l to r) Vicky Harper-Hall, Tizoc Loza, both of Northrop Grumman, Tracy, and Northrop’s Gloria Pualani smile for the camera after the awards luncheon presentation. The Northrop Grumman awards luncheon celebrates the great small business procurement results that Northrop Grumman achieves annually. Sophia graduated with a Bachelor of Science in Psychology with a minor in Business. She finished her degree in three and one-half years and will be pursuing an advanced degree in the near future. Great Going Sophia! Thank You To All Who Attended The Last Chamber Meeting For 2014 – SoCal/SD Joint Holiday Celebration! It was a great end to the Chamber’s meeting schedule at last Tuesday’s Joint SoCal/SD Chapter Holiday meeting hosted by and at Chapman University in the City of Orange. We thanked Chamber Academic Advisory Council member, Dr. Victoria Morris (above left) for hosting the membership and our Advisory Council retreat meeting. Everyone enjoyed a great meal - exhibited above by Golden State Water’s Emma Maxey. 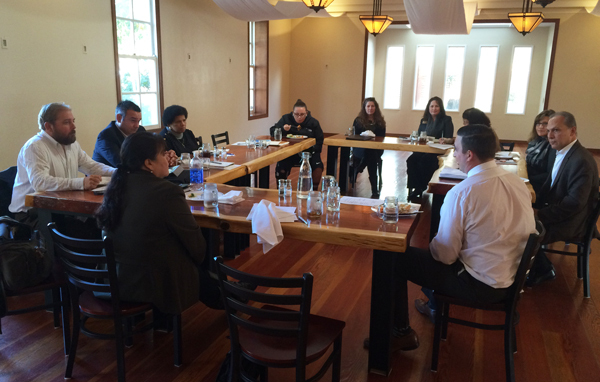 Our program featured an end of year review and a group planning discussion focused on strategies for a great 2015 for our work to build Native American businesses. We also donated toys for deserving Native American children to the Southern California Indian Center Toy’s Drive (group photo above). 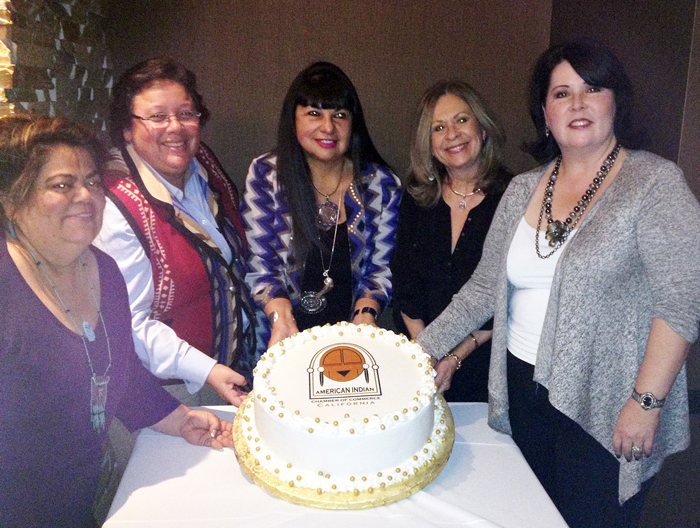 Thank You Dry Creek Band Of Pomo Indians - Northern California Holiday Meeting Success! Our American Indian Chamber thanks the Dry Creek Rancheria Band of Pomo Indians for their kind hosting of the Chamber’s annual Northern Cal Chapter Holiday event. The meeting started at 9:00 and included a discussion on the Chamber’s annual events, mixed in with a PTAC Procurement training. Our Advisory Council members who attended added to the discussion and we all had time to learn, discuss and enjoy the meeting. Thank you once again to the Dry Creek Rancheria Band of Pomo Indians for their support of the Chamber by hosting this event. Pictured above is Tieraney Giron, a longtime friend of the Chamber, receiving a thank you gift from Chamber President Tracy Stanhoff. Tieraney was elected to the Dry Creek Rancheria Tribal Council recently. Tieraney arranged for the Chamber’s day and provided great food and beverages. We are proud of our partnership with the Dry Creek Tribe. 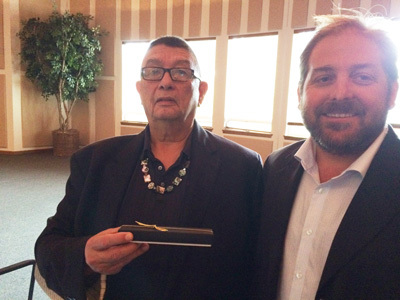 Our longtime friend Reg Elgin also attended – introducing the Chamber once again to Tieraney, now a tribal leader. Great to see you Reg and thank you Tieraney!! Chamber members please confirm with Sophia if you are able to join us in the Nation’s Capitol representing California at the National Chamber meeting. This meeting will be held on December 9 and 10 at the Holiday Inn Capitol that is located near the National Museum of the American Indian and the US Capitol building. A group hotel rate of $199 per night is offered by calling 877-572-6951 and using the group code C7C. Our American Indian Chamber and our Procurement Technical Assistance Center was well represented this past few days in Atlanta at the National Congress of American Indians (NCAI) Annual Conference. NCAI is the oldest and largest annual gathering of the tribes in the United States. 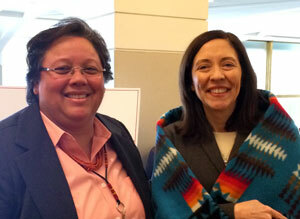 Highlights of the event included a presentation by the Secretary of the Department of the Interior Sally Jewel. Pictured in the photo above are Chamber board member and San Diego Chapter leader, Cheri Myron and our PTAC Program Manager Venessa Gleich. We met with several tribal leaders and their staffers in attendance form California and our additional service territory of our PTAC of Nevada, Utah and Arizona. Chamber president Tracy Stanhoff also attended and joined in the dialog during the Economic Development and Employment Committee meetings. One of the topics that resonated during that discussion was the Chamber’s work in promoting infrastructure development on tribal lands. We also supported for consideration a funding resolution providing for job training program focused on developing Native Americans for the energy industry workforce. The American Indian/Alaska Native Tourism Association also put forth a resolution supporting their great work in Indian Country. Thank you to PG&E’s Jerilyn Gleaves for her setting up of a wonderful Northern California Chapter meeting held earlier this week. Jerilyn and her team from PG&E including purchasing department agent Rudy Promani (pictured above) provided a great presentation on responding to PG&E’s inquiries and bids – let’s just say we got the real story with some great tips for success. As shown above, the meeting was set up in a roundtable format where everyone who attended had access to the PG&E team. Another really great partner who presented and attended this meeting was Douglas Phason of the California Public Utilities Commission Supplier Diversity department. Douglas had completed much homework on the Native American spend within GO-156 and provided us with great ideas of how our businesses can achieve more of the opportunities. 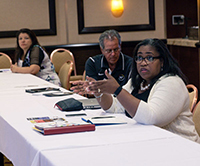 Chamber Corporate Advisory Council member, Charmaine Jackson (above), chair of the California Water Association Supplier Diversity team and of San Jose Water also attended our meeting and provided her input during the dialog. Thanks also to all of the Chamber members who attended! Thank you to SDG&E’s Jaymee Lomax for setting up a wonderful San Diego Chapter meeting held last Friday at the SDG&E Energy Innovation Center (EIC) in San Diego. As shown above, Chamber meeting attendees were taken on a tour of the EIC and were led on this tour by Cece Cazares of SDG&E. The photo above shows the Chamber group listening to Cece discuss water-wise plantings to help out during our drought. 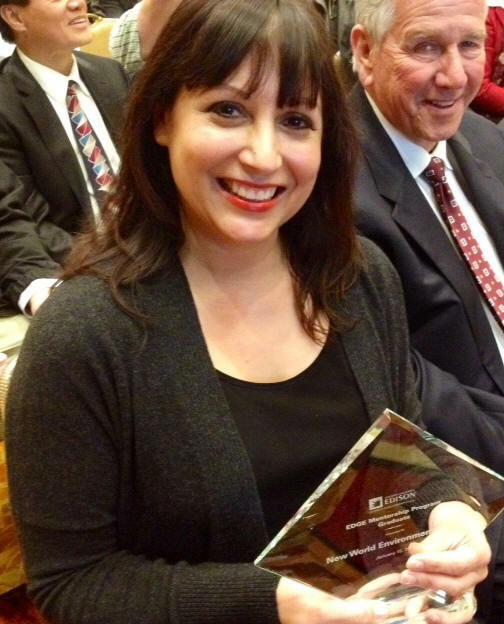 Many of you may remember Cece from her tenure as past SDG&E Supplier Diversity Director Frank Urtasun’s administrative assistant. Now Cece serves as one of the EIC’s tour leaders. After showing the Chamber members the latest and greatest in energy efficiency for home and business, Cece returned control of the meeting back to Jaymee Lomax. Jaymee then provided an overview of the next few months of SDG&E’s procurement contracting opportunities. Lunch, networking and Chamber updates were next on the agenda. 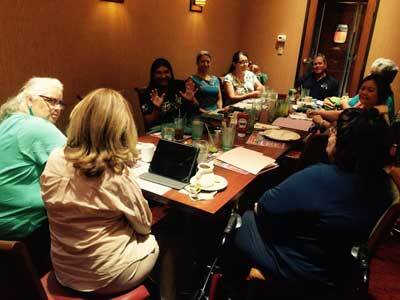 The meeting wrapped up with future meeting dates and other announcements. Thanks to all who attended and learned of the special codes to put in your email subject line to garner expedited attention from Jaymee. Remember when you attend these Chapter meetings, you receive extra special tips and access to those who can help your business grow quicker! 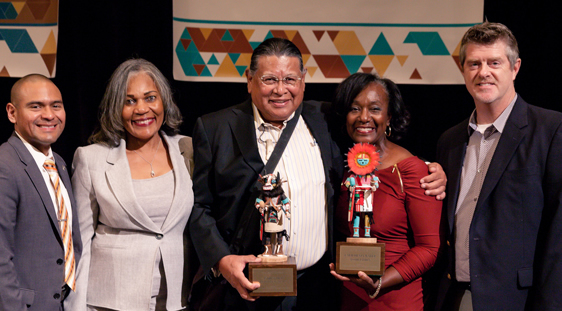 This year’s California Public Utilities Commission’s (CPUC) annual EnBanc regarding the GO-156 implementation was a very successful one in the Chamber’s quest for greater recognition of our American Indian/Alaska Native owned businesses. For the first time, our lack of numbers in procurement from many of the GO-156 regulated companies was addressed in the annual report from the CPUC. We remain ever vigilant and hopeful that our low procurement numbers will keep increasing as many of our businesses are obtaining contracts through the hard work of everyone involved in the Chamber. Chamber President Tracy Stanhoff, pictured above left with CPUC President Michael Peevey and Chamber member Allison Hicks, presented on “payment terms” during the Community Based organization/ Business Association panel. We have great partners within the GO-156 regulated companies and at the CPUC and we will all continue to work to make contracts a reality. We will bid a sad farewell to outgoing President Peevey who is coming to the end of his second term as CPUC President and will retire from the post at the end of this term. President Peevey has been an unparalleled diversity advocate, transforming the state of California’s regulated utilities, telcos, water and cable companies processes of inclusion in their procurement and supply chains. THANK YOU MICHAEL PEEVEY! Last week, we welcomed the new president of SCE, and this week we extend a belated but heartfelt welcome to new SoCalGasCo president Dennis Arriola- photo center – enjoying the post CPUC EnBanc reception with Chamber member Allison Hicks and Chamber President Tracy Stanhoff. Pictured center above Dennis has taken over the reigns of our good partners at the Gas Company and is a stalwart advocate for diversity. Welcome Dennis! Chamber members are shown in the photo above enjoying a delicious dinner by Mimi’s Café and training conducted by AICEF PTAC Program Manager Venessa Gleich. 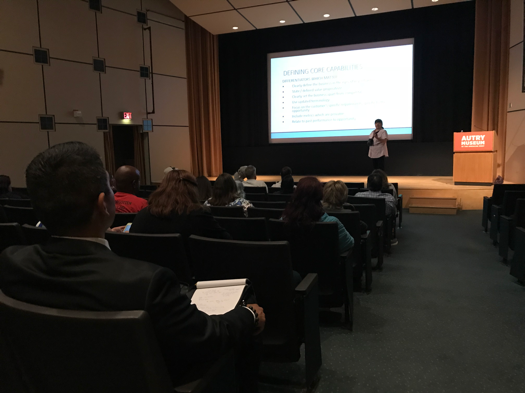 Venessa informed attendees of the some of the latest options for marketing and finding opportunities for our businesses while providing an overview of the fiscal year (FY) 2015 opportunities being announced on several websites. 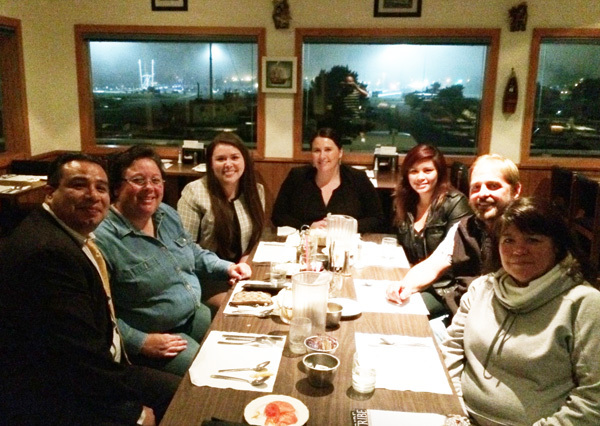 Chamber president Tracy Stanhoff (2nd right) met with new SCE president Pedro Pizarro (far right) at a recent dinner. 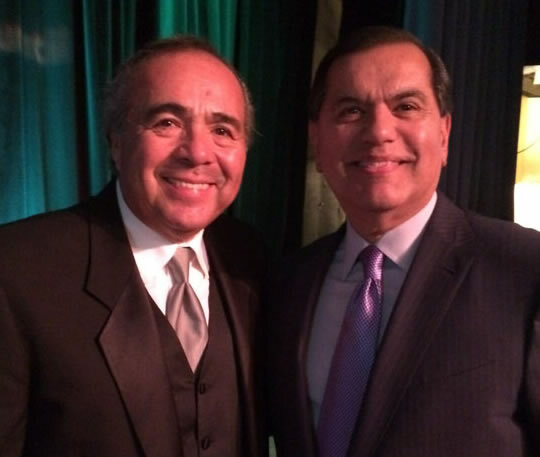 Pedro was most recently the president of Edison Mission Energy and has served as SCE’s vice president of Strategy and Business Development among other leadership positions within SCE and its parent company Edison International. Also pictured is SCE vice president of Local Affairs, Veronica Gutierrez (2nd left) and SCE Supplier Diversity Senior Manager Eric Fisher (farleft). 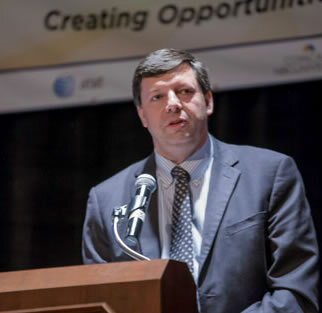 In this meeting, SCE’s new president reinforced the company’s commitment to supplier diversity. Chamber President Tracy Stanhoff hosted the leadership of the US SBA to her offices at AD PRO and to a Roundtable discussion with American Indian/Alaska Native (AI/AN) businesses from the Chamber. It was an awesome event moderated by the Assistant Administrator, Office of Native American Affairs, Christopher James, linking our AI/AN businesses with the topmost leadership of the US SBA. Special thank you to Chris for selecting our Chamber for this event! Administrator Contreras Sweet toured the AD PRO facility then joined a number of great Chamber member businesses for a discussion on Indian Country economic development and the US SBA services. 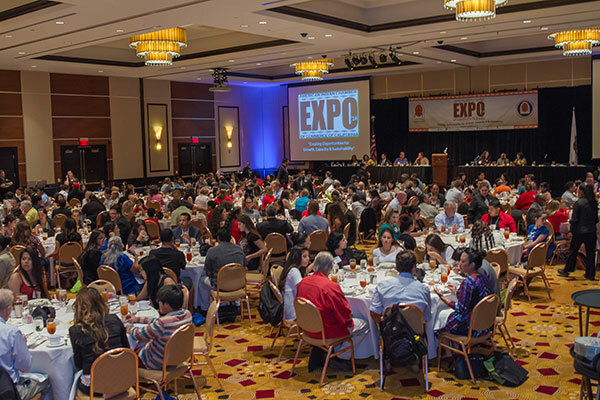 Over 400 Adults and Youth attended the 11th convening of our annual conference and trade fair – EXPO ’14. First, thank you to all of the great volunteers, Chamber Staff and AICEF PTAC staff for their work and energy in making the EXPO a success. Many thanks also to our Chamber Corporate, Tribal and Academic Advisory Councils for their great work in planning and actively participating in the EXPO. And many, many thanks to all of our sponsors and opportunity drawing donors who provided the resources and vital funding for the EXPO and our scholarship fund. Were won by an awesome team from the MWD – congrats to you all (John Arena & Company) – you earned the bragging rights for the year. Tribal Leader Roundtable – Thank you to Pechanga Tribal Councilman Andrew Masiel, Sr, Brian McDonald, Reg Elgin and all who provided great insight to the session, which was led by our CPUC Commissioner Catherine Sandoval. It was hard for us all to not shed a tear in thanking Sheriff Joe for the great 20 years of support for the Chamber. Thank you to all of our afternoon breakout session speakers. Also, the Tuesday morning General Plenary Session also provided unbelievably great information for our businesses and tribal enterprises. Our luncheon speakers --our friendly Professional Engineer and SoCalGasCo Vice President Doug Schneider and our great CPUC advocate Commissioner Catherine J.K. Sandoval provided high level keynote presentations to our adult and Jr. American Indian Chamber attendees. A big thanks to our Chamber Advisory Council members and Karen Blackwell from Nestle who sponsored and created much of the content for the very popular session. Chamber businesses have an excellent opportunity to personally shine in front of many major corporations, utilities and government agencies seeking to do business with Indian Country. YES, THIS WAS THE MOST IMPORTANT INDIAN COUNTRY ECONOMIC DEVELOPMENT CONFERENCE YOU CAN ATTEND ANYWHERE! If you missed it, plan on joining us in 2015. ATTENTION – All Chamber members and supporters – Join in the party on Friday night, August 8th for our own Los Angeles Sparks versus Shoni’s Atlanta Dream 7:30 pm Staples Center. Shoni, hot off of her WBNA All Star Game Most Valuable Player award comes into town to take on Candace Parker and the rest of the Sparks. Great seats available at good rates to allow you to take the whole family and a ton of your best friends. Tracy says we hope to see you all there – and our good friend with the Sparks, Christine Simmons asks that everyone get into your seats early to enjoy Native American dancers in honor of American Indian Appreciation Day! Who Is Coming To Meet You? LOS ANGELES, CA– The June Luncheon was wonderful and flavorful once again. The day started with a wonderful AICEF PTAC training (pictured above) with the Boeing Company, Nestle and Toyota participating. We then adjourned to Maurice Begay and company’s luncheon feast of Indian Tacos, Frybread and stew. Thank you Maurice, American Indian community members and Southern California Indian Center staffers for assisting us with this luncheon. Thanks to all who donated prizes and purchased tickets for our Scholarship fundraising opportunity drawing. Finally, thanks to our Chamber staffer, Sophia Gleich; PTAC Staffers Kent Muller and Annette Wakolee; and our Procurement Technical Assistance Center Manager Venessa Gleich for being their usual best. 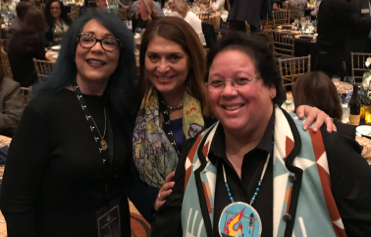 Chamber President Tracy Stanhoff, AICEF PTAC Program Manager Venessa Gleich and several Chamber Tribal Advisory Council members attended the Mid Year convening of the National Congress of American Indians. 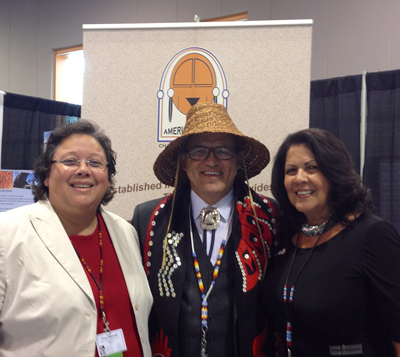 Chamber President Tracy Stanhoff, and Chamber Advisory Council Member VaRene Martin of NAFOA flank NCAI President and Swinomish Chairman Brian Cladoosby in front of Chamber/AICEF PTAC outreach exhibit. 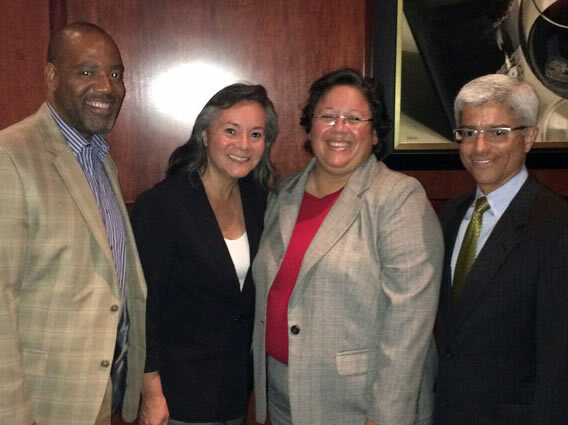 “Building Infrastructure In Indian Country Summit” An Awesome Event – Thank You CPUC Commissioner Sandoval, Our Sponsors & Participants! 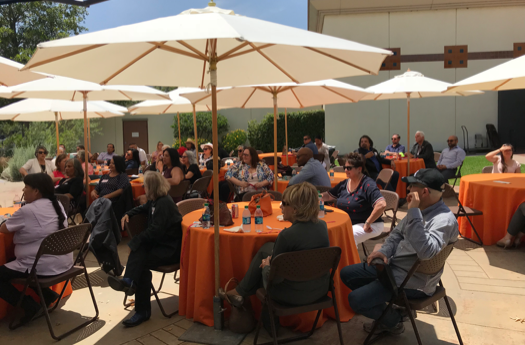 LINCOLN, CA– This was a historic convening of many tribal leaders, staffers, our Chamber business members and the industry members who build infrastructure in California. There will be a more formal report of this event out soon and we have many folks to thanks and recognize for helping put this program together. However, first and foremost thanks to California Public Utilities Commissioner Catherine Sandoval for inspiring this great gathering. Above, Chamber board member Cheri Myron (left) and Chamber President Tracy Stanhoff (right), honor Commissioner Sandoval (center) with a shawl to formally end the roundtable. 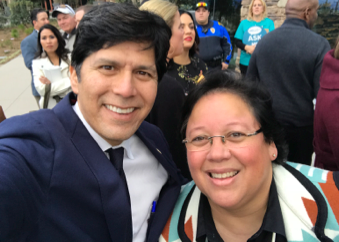 Thank you again to the Thunder Valley Resort and the United Auburn Indian Community including Tribal Secretary Danny Rey for their hospitality and to our sponsors, Southern California Edison and AT&T. 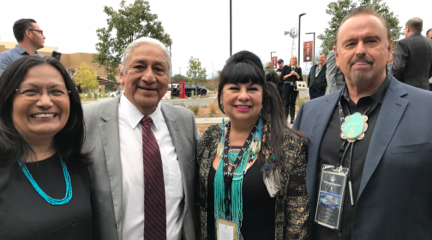 We had tribal leaders attend from tribes statewide including Rincon Band of Luiseno Indians Chairman Bo Mazzetti who spoke elegantly on the water needs of many tribes in San Diego County. 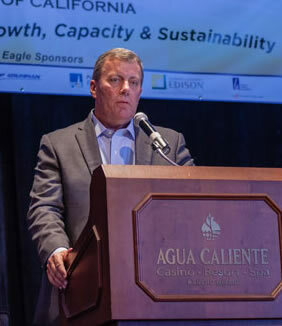 The Morongo Band Of Mission Indians supported the event by sending their tribal CEO Roger Meyer to speak on their ground-breaking partnership with Southern California Edison on their right of way agreement. From the state of California, we had Cynthia Gomez, Tribal Liaison from the Governor’s Office and Anecita Agustinez from the State of California Water Department and we thank both of them very much for their time and expertise. 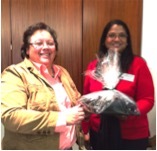 And many thanks to Stephanie Green, Ditas Katague, Ann Christina Rothchild of the CPUC. Finally, thanks to our great Chamber staffer, Sophia Gleich and our Procurement Technical Assistance Center Manager Venessa Gleich for being their usual best. 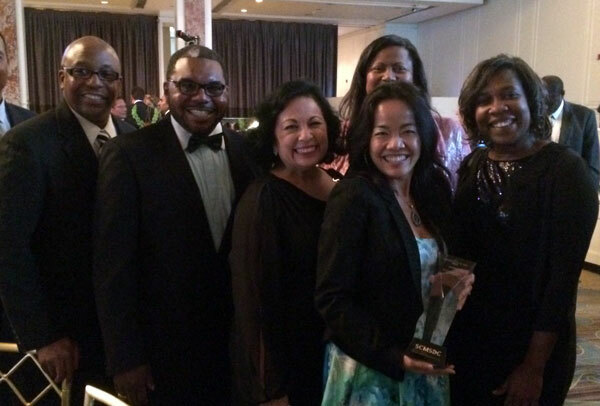 The Chamber sends out a whole-hearted congratulations to member Deborah Hamilton, President of Teehee Engineering for her selection as the 2014 Minority Owned Small Business of the Year as presented by the US SBA San Diego office. Debbie will receive her award on June 11 during the 2014 Small Business Week Awards breakfast at the Town and Country Resort and Conference Center in Mission Valley. Congrats again to Teehee! Event photo will be shown in a follow up edition to the Chamber e-News. We are saddened to announce the passing of long time Chamber member and Accountant Francis Billedeaux. Francis passed a couple of weeks back after being diagnosed with terminal cancer. 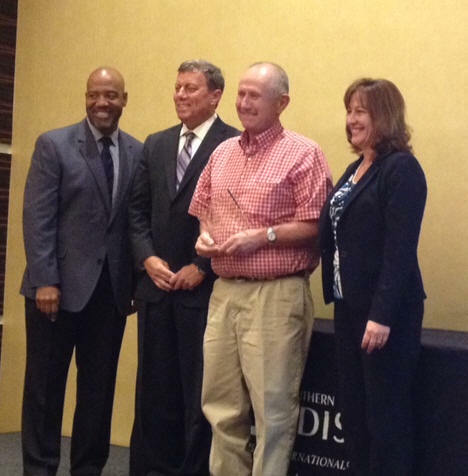 Francis operated his business with zest and integrity and the Chamber thanks him for his many years of tax assistance. He will be missed. 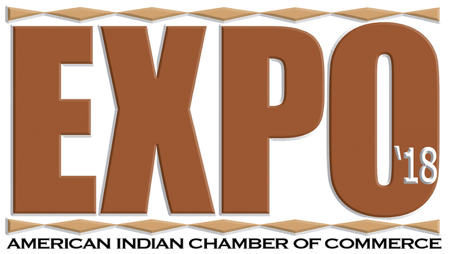 It is that time again, EXPO in “Caliente” July.We are lining up the opportunities and contacts for tribes, tribal enterprises and Indian owned businesses to GROW! Online registration coming soon – THIS IS THE MOST IMPORTANT INDIAN ECONOMIC DEVELOPMENT CONFERENCE YOU CAN ATTEND ANYWHERE! The June Luncheon is an annual favorite for all Chamber members and supporters. This is the luncheon where we share our culture, food, salute those who supported our first half of the year activities, and preview the remaining year’s events. Also, as we have started in the past few years, we will have a training workshop presented by our AICEF – PTAC with presenters from our corporate partners. PHOENIX, AZ – In celebration of Small Business Week, the U.S. Small Business Administration is honoring Arizona entrepreneurs and small business champions for their contributions to the economy. “Each year the SBA has the honor of spotlighting Arizona winners of our Small Business Week awards in a ceremony that recognizes and celebrates the entrepreneurial spirit and community activism that has long characterized the small business community of our great state,” said Robert J. Blaney, the District Director of the SBA in Arizona. Venessa, an enrolled member of the Ohkay Owingeh (formerly San Juan Pueblo) tribe, has been with our American Indian Chamber Education Fund Procurement Technical Assistance Center (AICEF-PTAC) since 2009. There are 92 PTACs across the country but only six specialize in helping American Indian owned companies. 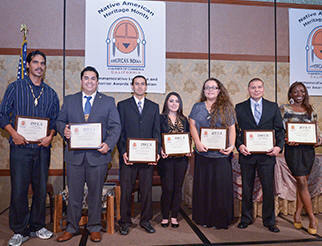 The AICEF – PTAC serves the states of California, Nevada, Utah, and Arizona and over 120 tribes in those states. 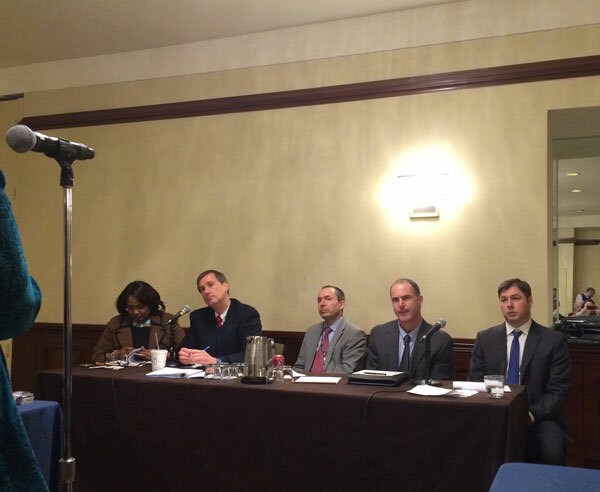 “Federal contracting requires companies to navigate a maze of processes and requirements. For small companies unfamiliar with steps, the challenges can seem overwhelming. A helping hand from one who knows the way can make all the difference. For many Native American companies, Vanessa is the go-to person,” states the SBA. The awards will be presented during the Arizona Small Business Association’s (ASBA) annual awards luncheon on Wednesday, May 7 at the Scottsdale Princess Resort and Conference Center. Event information is available from ASBA at 602-306-4000 or www.azsmallbizcon.com. The Chamber is very thankful to the leadership and support of this new event to the Chamber year from CPUC Commissioner Catherine J.K. Sandoval and the California Public Utilities Commission (CPUC). Building Infrastructure In Indian Country – A Roundtable & Summit on Energy, Telco & Water Development presented by the Chamber in partnership with Commissioner Sandoval, the CPUC, and supporting tribal organizations – the California Nations Indian Gaming Association, the California Association of Tribal Governments and more to come on board, is a special event developed in order to address the infrastructure needs on reservations and assist our American Indian/Alaska Native businesses in participating in the build-out process. May 20 will start with an afternoon tribal leader consultation and listening session roundtable followed by a dinner reception. May 21 will feature a morning of plenary sessions on energy, telco and water development followed by a luncheon then an afternoon of connection meetings for tribes and one on one match-making for American Indian businesses and the utilities. Planning is underway and there will be a very small table top trade show/demo area for businesses to exhibit and outreach on May 21. The event is free of charge courtesy of sponsorships of Southern California Edison and AT&T thus far. However, to reserve a table top exhibit space, there will be a $100 charge. Space is limited. Contact Sophia at events@aicccal.org or 213-448-2330 to register or go online by clicking here. What an evening – great presentations, fellowship and a salute to those who made Star Wars in a Navajo language version combined for a wonderful event to honor Natives making strides in the entertainment media. Special kudos to event Producers - Native comedian Jim Ruel and David Morgan who also ended the evening by wrapping up and thanking the audience. Special thanks goes to the event producers shown above, Jim Ruel, David Morgan and Kathy Peltier (not pictured) whose vision for developing this event is to honor those Natives in entertainment by providing substance in a discussion of the status of the industry for Natives and sharing stories of success from our people. 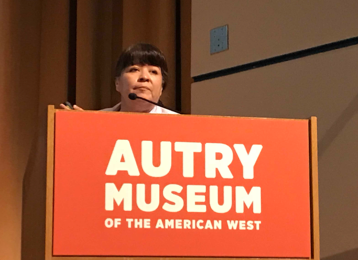 Also a thank you to the Autry Museum and Dianna Terrazas for hosting in their Wells Fargo Theatre. Thank you to our fellow American Indian Chambers and Chamber members, Corporate and Government Partners for making this annual get together another great success. Special thanks to Kenyatta Lewis of MGM Resorts for her hospitality and participation; Eric Fisher and Dennis Thurston of SCE; Regina Glover of Northrop Grumman; Caren Bowman of AT&T and several members from the Boeing Company including Jonathan Greyeyes, Crystal White, Elaine Clemens, new gal Valerie Johnson, and the new guy Dan Szczuka for their staffing of one on one tables. After enjoying a delicious three course meal, state Chamber presidents provided an annual update of their state activities. Then a discussion of our next National Chamber event which will be held this September in Washington, D.C. was held. This event will be a combination roundtable strategic planning discussion, supplier diversity procurement event and national legislative day. All will be welcome – stay tuned for the details. Chamber President Tracy Stanhoff Attends National Congress of American Indians Winter Executive Session In Washington, DC. 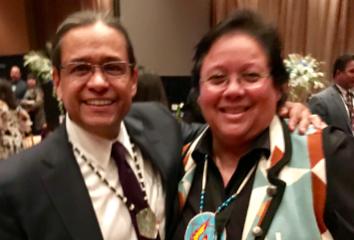 Chamber President Tracy Stanhoff joined tribal leaders from around the Nation for the Annual Winter Executive Session for the National Congress of American Indians (NCAI) held last week in Washington DC. Attendees heard from White House staffers, numbers of members of Congress, government agency leads and tribal leaders on the latest legislative issues affecting Indian Country. Senator Elizabeth Warren (D-MA) and Tracy were able to talk about the needs of American Indian business during NCAI Reception at the National Museum of the American Indian. Tracy also met with Senator Maria Cantwell (D-WA), Chair Senate Committee on Indian Affairs & Member Senate Committee on Small Business & Entrepreneurship. Top discussions included a presentation on the fix to Carcieri, updates from Assistant Secretary—Indian Affairs, Kevin Washburn; Jodi Gillette, Senior Policy Advisor for Native American Affairs, Domestic Policy Council, the White House; Chairman Tom Wheeler of the Federal Communications Commission; the US SBA and numbers of Obama Administration Cabinet Secretaries. The Chamber has received many inquiries regarding the tragedy that unfolded last week at the Cedarville Rancheria reservation. The good folks at the Cedarville Rancheria are not Chamber Tribal members. Nevertheless, the Chamber extends our heartfelt condolences for those lives lost-- and we express great sorrow over this act of violence in Indian Country. We can all agree that violence is never an answer for disagreements and is happening way too frequently in today's society. Please join us in praying for the families of Cedarville Rancheria. Thanks to the Southern California Minority Supplier Development Council for their support, as the Chamber will once again be exhibiting at the Minority Business Opportunity Day to be held on March 5 and 6 at the Universal Sheraton. The great folks at the SCMSDC are also offering a discount registration for all Chamber MBE members. Go to scmsdc.org and enter attendMBOD for the 20% discount. Please make sure to mark your calendars to join us at two of our most popular events - the EXPO and our Native American Heritage Month celebration. 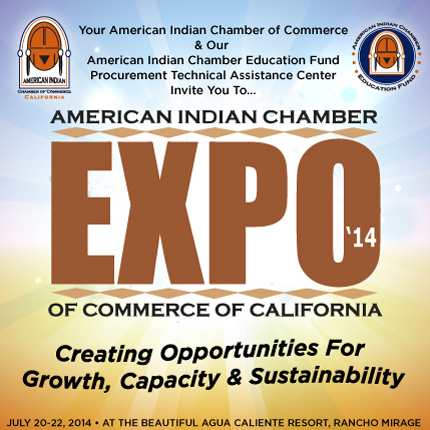 EXPO '14 will be held July 20-22, 2014 at the lovely Agua Caliente Resort in Rancho Mirage, California. 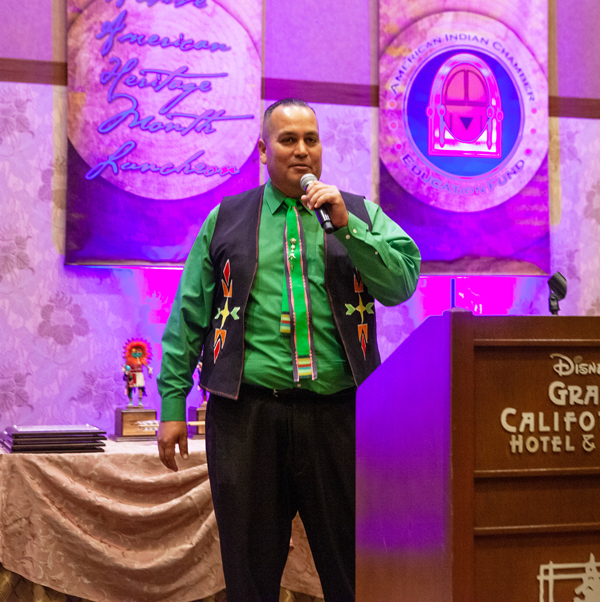 Our Native American Heritage Month Luncheon will be on Thursday, November 20 at the Grand Californian Hotel at Disney Resort in Anaheim, California. Stay tuned for more details and registrations for each of these great events. A big thank you goes out to Chamber Board Secretary, Sara Finseth for staffing the Chamber booth at the recent Western Indian Gaming Association conference. The Chamber supports the efforts of the California Nations Indian Gaming Association, the organization who conducts this conference. 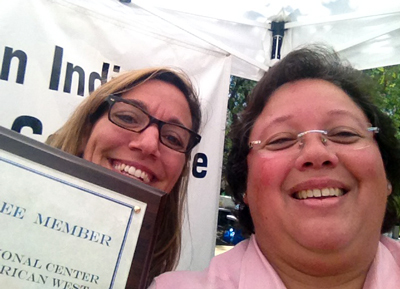 Sara made some great new contacts for the Chamber adn conducted informational outreach promoting the use of Indian businesses and our meetings throughout the remainder of 2014. If you do not receive a form in the next week and you are a member or want to be a member contact Lynda at 213-448-3232. Keep an eye out for a letter from the Chamber with your directory update form. The completed forms with and without any revisions are due back to our Los Angeles office on or before February 15. Please get your forms back in asap! 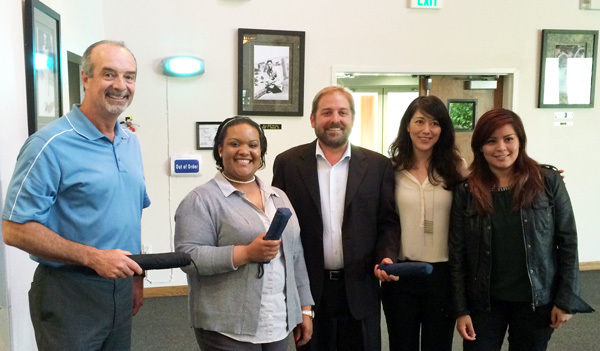 Two of our Chamber member businesses recently graduated from SCE’s EDGE Business Mentorship program. Allison Hicks of New World Environmental, Inc. and Tim Messer of Tim Messer Construction completed this 18 month business capacity building program that assists minority businesses in developing and getting the EDGE needed to succeed in the utility industry and specifically at SCE. Chamber President, Tracy Stanhoff, also participated on the coaching team which was operated by Barbara Sullivan and Chuck Bray at Sullivan International.